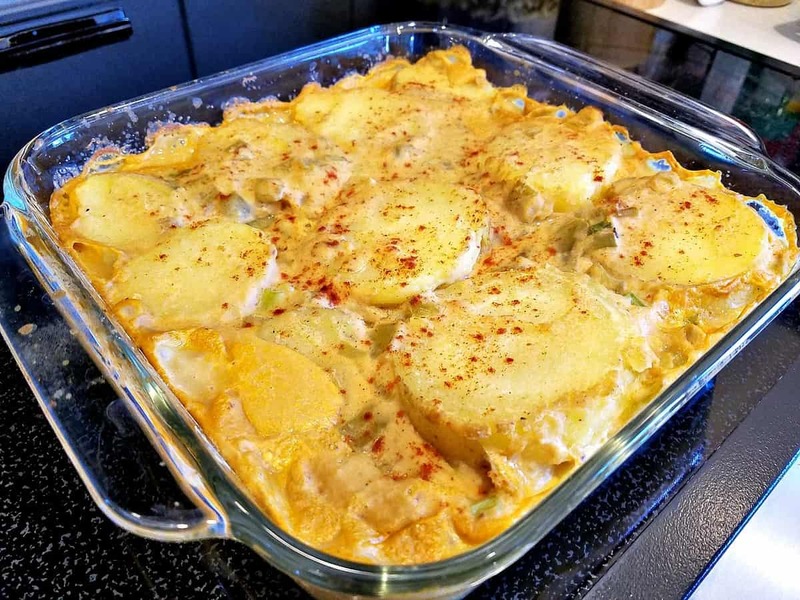 I have been asked many times to publish a holiday potato recipe, so without further ado, here is my Vegan Scalloped Potatoes Recipe. It’s super creamy, slightly cheesy, and with just the right amount of spice to make this a new holiday favorite. 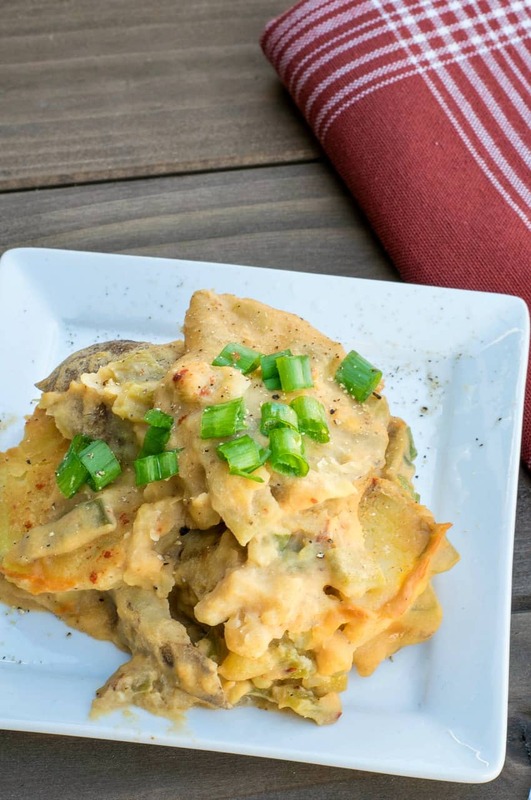 Whether it’s Mom’s creamy Scalloped Potatoes you grew up with, or the cheesier Gratin Potatoes you came to love later – there’s one thing they both have in common. Loads of heavy cream, butter, and cheese can add as much as 19g of fat per single serving to this traditional American Favorite. So what I did was replace that fat. Not with cashews mind you, which many bloggers like to use for their cream sauces. But with something a little more allergy friendly. More and more, I am finding that everyday White Beans (great northern, cannellini, etc) make JUST as creamy a sauce as cashews, and of course without all the extra scale-rising fat. I first used White Beans in a sauce when I made my Summer Vegan Potato Salad and used them to make the mayo. It was SOOOO good, and judging by the rave reviews, I knew I was onto something. So now, whenever I have an opportunity to use White Beans in anything, I jump at the chance. They’re low in fat, typically allergen-free, and loaded with vitamins, minerals, and fiber….. oh yeah including PROTEIN. So the next time someone asks you “But where do you get your Protein?” you can tell them…. Let’s go cook some taters! But we DO want to cook them beforehand, however you like to cook potatoes. Boil, bake, microwave, or even Instant Pot. I used my Instant Pot and the steaming trivet that came with it. Just add 1 cup of water to your IP basket, place the trivet in the bottom, place your scrubbed & pierced potatoes on the trivet, and attach the lid. Make sure it’s set to SEALING and then use the STEAM function for 10 minutes. Afterward, I used the QR method (quick release) to remove any remaining pressure and then removed the lid to let them cool while I tended to the sauce. Drain a 15oz can of White Beans (I used cannellini) and add them to your blender. Now add the almond milk, garlic, nutritional yeast, the chipotle pepper with about 1 tsp of the adobo sauce, the cumin, salt, and pepper. Now pour the sauce into a medium-sized saucepan and add 2-3 chopped Green Onions, and a 7oz can of Chopped Green Chiles (drained first). Slice your (now cooled) potatoes into rounds – 1/4″ to 1/2″ thick. 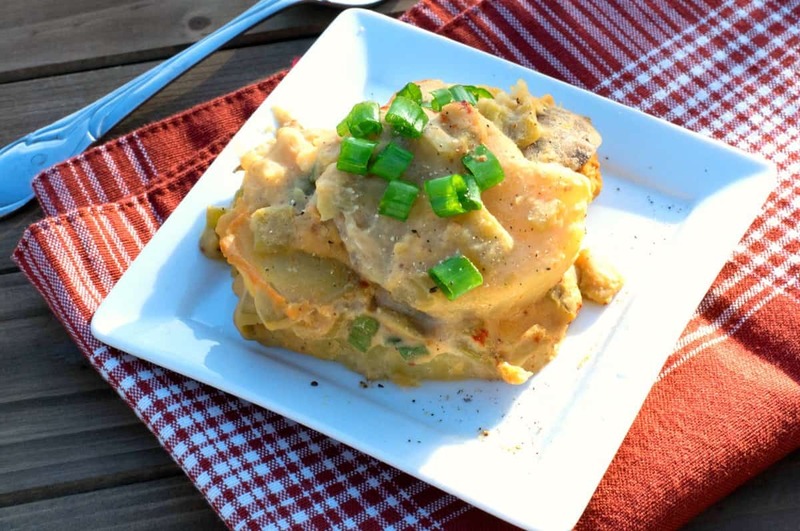 Spread a thin layer of sauce across the bottom of an 8″ casserole dish and place a single layer of potatoes on top. Layer more sauce, more potatoes, etc. until you end up with any remaining sauce on top. Sprinkle with paprika (I like smoked paprika), cover with aluminum foil (no – the foil did not touch my food – for those of you who worry about aluminum), and bake for 15 minutes. Remove the foil (or lid) after 15 minutes and continue baking for an additional 15 minutes or until bubbly. That’s it for this week, be sure and check out my Brand New Vegan Podcast (if you haven’t already) and also my revamped YouTube Channel! That’s right, I am now adding HOW TO videos and so far I’ve had nothing but positive reviews! Check them out and if you don’t hear from me before next week – on ANY of my various Social Media Channels…. It's super creamy, slightly cheesy, and with just the right amount of spice to make this a new holiday favorite. Cook potatoes - but leave firm enough to slice into 1/4" rounds. They will continue cooking in the oven. IP Instructions: Place 1 cup water in your IP along with the steaming trivet. Place potatoes on the trivet and attach lid, set to SEALING. Select STEAM function and 10 minutes. Use Quick Release to carefully remove pressure and allow to cool. Add almond milk, nutritional yeast, garlic, chipotle pepper, adobo sauce, cumin, salt, and pepper. Blend until smooth. Pour sauce into a medium-sized saucepan and add chopped chiles and onions. Simmer, stirring occasionally, until slightly thickened. Line an 8" casserole dish with a small amount of sauce (enough to cover). Then add a single layer of sliced potatoes. Repeat with more sauce, another layer of potatoes, etc. finishing with the remaining sauce on top. Garnish with smoked paprika and cover with lid or foil. (Note: if the foil touches the food, you can use parchment paper to separate if you wish). Bake in a 400 degree oven for 15 minutes. Uncover dish, and continue baking for an additional 15 minutes. Love your recipes, Chuck. This is sure to be another hit. Thank you for the IP instructions. it looks awesome… can’t wait to try this… now can you please explain where to get the Adobo sauce? Our grocery stores sell little cans of Chipotle Peppers in Adobo. This looks perfect! Love that you used beans Instead of cashews. Looking forward to trying it for my Easter side dish. You could add either a little (to taste) Chipotle Chili Powder, or some Smoked Paprika mixed into the sauce. to add to the beans for blending ? All the specific ingredients and amounts are listed in the recipe box. I had to make a few changes due to lack of availability of some items but it was still great! This will be a regular at my house. Thank you. Thanks Chuck. I am sure this is going to be wonderful. Can’t wait to cook it up. There are a few variations for Abodo sauce, find one that fits your palate. I made this yesterday, easter Sunday, and oh, so good! there is not much I’d change…I used a small chipotle and that was just enough. Not usually a fan of white beans blended, this was for the win!! I know I cannot go wrong when Chuck offers a southwest flavor to his recipes!! Yes , it’s a keeper! I love this, Thank you so much. I did try frozen hash browns and bean sauce with some of your cheese sauce recipe, I will precook next time, but it was so delishious, I will be making this a lot. OMG THIS IS DELICIOUS!!!! Thanks so much for posting, will definitely be making these again!!! Sounds great, love the idea of using beans! I’m going to try this tonight except going to attempt the ultimate lazy, one step IP hack of layering and assembling everything into a dish that will fit inside the IP, and steaming it for 1/2 hour or so, Ya never know unless you try right? The worst that can happen is it needs to be cooked more or less I ‘spose. Not terribly picky as long as it tastes good, I know from past experiences that you can’t cook food with thick sauces in the IP directly, but have used steaming with the pot in pot option to bypass the problem with other dishes, so we’ll see! Thnks. I was able to find adobo powder not the sauce. Can the powder be added as a replacement? If so how much do you reccomend using? Thank you, Chuck. This is our new favorite. Absolutely delicious. Can this recipe be used in a marys mini? Or not because of the beans?